Of the five scholarship freshmen who came to OSU this past season, only two remain. 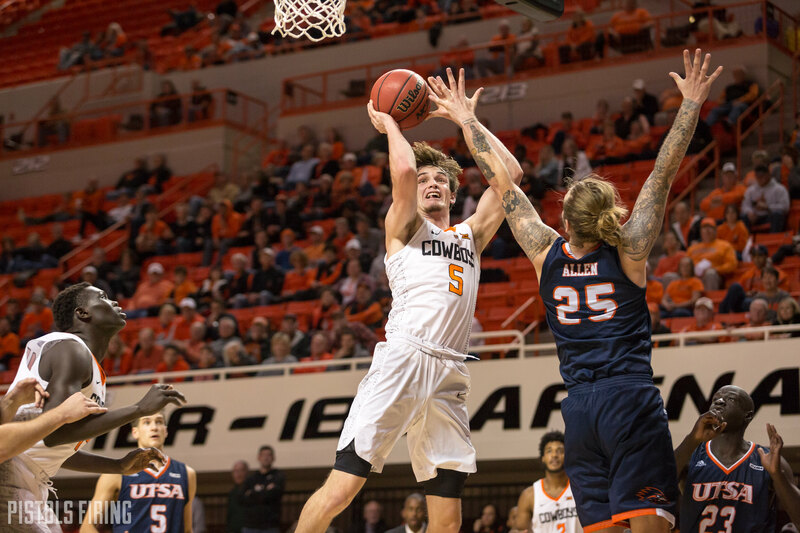 On Thursday, Duncan Demuth announced he would transfer from Oklahoma State after one season in orange and black. After OSU’s roster trim in mid-January, Demuth played only 6.7 minutes per game despite the Cowboys having only seven scholarship players available. With the Cowboys adding to that roster with a solid recruiting class, it might have been tough for Demuth to get more minutes. Although he didn’t have the most impressive stats at 0.9 points and 1.3 rebounds a game, Demuth did provide a few sparks for the Pokes this season. He started in three games early in the season and will best be remembered for his hustle plays, like when he crashed to the white maple hardwood against West Virginia. Demuth’s departure leaves three players on OSU’s 2019-20 roster who are 6-foot-7 or taller. Those three are Cam McGriff, Yor Anei and Kalib Boone. At 6-6, recruiting sites list Keylan Boone as a power forward or a center. OSU coach Mike Boynton has three scholarships available after Demuth’s decision to transfer, and it’s highly likely at least one of those will be used in the frontcourt. OSU has a few big men targets in junior college transfer Doudou Gueye and late-rising senior Kevin Cross. Sources told Kyle Boone that Maurice Calloo is also in play for a return. Gueye will visit Stillwater this weekend. In his sophomore season at Daytona State, Gueye averaged 11 points and 7.4 rebounds a game. In his final five games of the season, Gueye averaged 16.2 points and 10.6 rebounds. Gueye would add a body and some collegiate experience to the Cowboys’ frontcourt while not overloading what looks to be a large freshman class. Out of Little Rock, Arkansas, Cross is missing from online recruiting services, but has picked up late offers from OSU, Illinois and Southern Miss. Cross, who is listed at 6-foot-8, might not be highly touted to this point, but he has some solid film on him. Calloo averaged 2.5 points and 1.6 rebounds in 16 games with the Cowboys this past season before being dismissed in January. Whichever bigs end up on the Cowboys’ roster, there’s opportunity for playing time behind McGriff and Anei. Again, it’s likely OSU will add a frontcourt member or two, but if not, the Cowboys have the option of playing small, giving Keylan Boone, Lindy Waters or even Marcus Watson minutes at power forward while still having guys such as Isaac Likekele, Thomas Dziagwa, Curtis Jones and Avery Anderson (plus any possible roster additions i.e. Chris Harris) to man the backcourt. Playing small wouldn’t make too much a difference in the Cowboys’ offense as there aren’t many back-to-basket power forward sets the Cowboys go into, but it could be problematic on defense if OSU is going up against a team that has two players on the floor with low-post abilities.